The Chart of the Day belongs to NexPoint Residential Trust (NXRT). 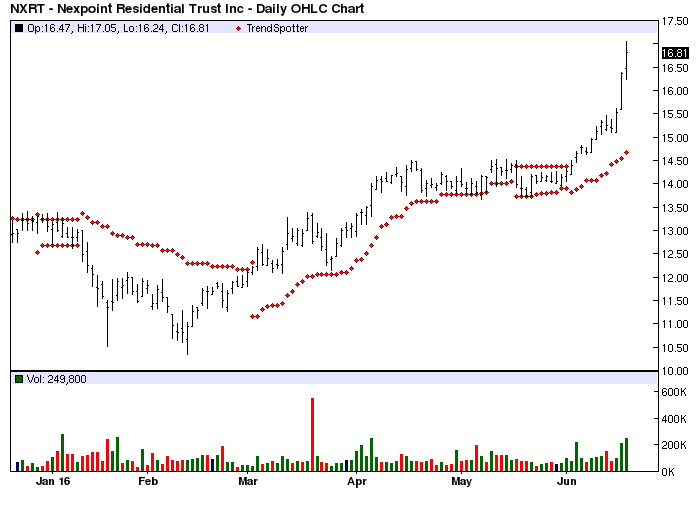 I found the REIT by using Barchart to sort today's All Time High list first for the most frequent new highs in the last month thne again for technical buy signals of 80% or more. I always use the Flipchart feature to review the charts. NexPoint Residential Trust, Inc. is engaged in acquiring, owning, operating and selectively developing multifamily properties. It operates primarily in the Southeastern United States and Texas. NexPoint Residential Trust, Inc. is based in Dallas, United States.